Fruiting body annual, terrestrial, fan-shaped to infundibuliform, pilei 8-18 cm broad, often clustered; margin level to uplifted, wavy; upper surface tomentose, white, pinkish, reddish-brown, tan to ochre-brown, faintly azonate; "aberrant fruitings" also produced, consisting of cauliflower-like masses, the entire surface poroid; context up to 1.0 cm thick, two-layered, upper layer soft-textured, lower layer leathery-pliant and tough; odor and taste untested. Cap (4.0) 6-12 (15) cm broad, convex, becoming plano-convex to plano-depressed; margin incurved, then decurved, overlapping the gills, occasionally wavy and appendiculate from veil fragments; surface dry, glabrous or with appressed fibrils, white to cream, bruising tawny-brown; context 1.5 to 2.0 cm thick, white, firm, tinged pale-peach when cut; odor and taste weakly of anise, musty when dry. Cap 3-8 cm broad, hemispheric to convex, expanding to plano-convex; margin at first incurved, then decurved; surface dry, disc glabrous to matted tomentose, fibrillose to squamulose toward the margin, cap fibrils hazel-brown to medium-brown over a cream-buff ground color; cuticle slowly bruising reddish, yellowing with KOH; context up to 5 mm thick, soft, off-white, bruising irregularly pinkish-vinaceous where cut; odor indistinct; taste mild. Cap 4-8 cm broad, convex, broadly convex to nearly plane in age; surface white, dry, innately fibrillose, finely-scaled at the margin, discoloring brown in age; flesh, white, moderately thick, firm, turning pinkish-red when injured; odor pungent of "mushrooms", taste mild. Cap 7-16 cm broad, convex at first, margin incurved, becoming plane, disk frequently depressed at maturity; surface white, smooth, though typically with warts or cottony scales. Cap tissue turning reddish-orange when cut. Odor, of brine or iodine. Cap 4-11 cm broad, cylindrical to convex becoming plane at maturity, sometimes with a broad umbo; surface dry, smooth to fibrillose, white on the cap margin shading to a grayish-brown disc; surface sometimes bruising pale yellow, conspicuously yellow in KOH; odor faintly of phenol, most noticeable in young specimens. Cap 2.5-4 cm broad, convex-umbonate to convex when young, expanding to plano-convex; margin at first incurved, decurved at maturity; surface dry, cream-colored, appressed-fibrillose, seldom squamulose, the fibrils slowly becoming yellowish-brown to tawny with age or from handling, the disc usually darker; context white, firm, relatively thin, up to 4 mm thick, unchanging; odor of anise; taste pleasant, sweet. Cap 2.5-6 cm broad, convex, expanding to nearly plane; margin at first inrolled, then decurved, plane to upturned at maturity; surface dry, the disc sometimes tomentose, becoming appressed squamulose, brown to greyish-brown, occasionally tinged vinaceous, the squamules often raised near the margin giving a shaggy aspect, obscurely squamulose to merely appressed fibrillose in age or from weathering; flesh thin, soft, pallid, discoloring slowly to pale dull-brown when injured; not yellowing in KOH; odor and taste mild. Cap 1.5-2.5 cm broad, egg-shaped in button-stage, becoming convex, eventually plano-convex; surface dry, the disc with lilac-brown to pinkish-brown fibrils, appressed fibrillose-squamulose towards the margin, the ornamentation over a pallid ground color; cuticle yellowing slightly where bruised or injured, yellow with KOH; context up to 3.0 mm thick at the disc, soft, thinning toward the margin; odor of anise; taste mild. Cap 4-15 cm broad, convex, becoming nearly plane in age, usually slightly umbonate at the disc; surface dry, appressed silky-fibrillose, occasionally with flattened scales, coco-brown to reddish-brown; flesh moderately thick, firm, white, soon reddening when cut; odor, strongly of "mushrooms"; taste mild. Cap 3.5-8.0 cm broad, at first obtuse-conic, becoming convex, expanding to nearly plane, in age the disc sometimes broadly depressed; margin incurved, then decurved to plane, occasionally upturned at maturity, often appendiculate with veil fragments when young; surface at first matted tomentose at the disc, medium-brown to hazel-brown, becoming fibrillose-scaly, especially near the margin, ground color pallid-buff; flesh white, firm, moderately thick, discoloring dingy reddish-brown when exposed; odor and taste mild. Cap 7-14 cm broad, convex at first, then plane; surface dry, white shading to a light greyish-brown disk, covered with appressed pale pinkish-brown to lilac brown scales. Odor mild or faintly of phenol. Turning yellow in KOH. Cap 2.5-4.0 cm broad, at first convex-cylindrical, expanding to plano-convex; margin incurved, then decurved, in youth often fringed with veil fragments; surface dry, appressed fibrillose to sparsely squamulose towards the margin, the ornamentation pinkish-brown to lilac-brown over a pallid background, with age the fibrils brownish, the cap bruising yellowish slowly; context pallid, firm, up to 5.0 mm thick at the disc, unchanging or darkening only slightly when injured; odor and taste pleasant, of anise. 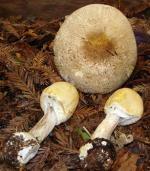 Cap 5-15 cm broad, convex, the margin incurved, expanding to nearly plane; surface dry, medium to dark-brown, appressed fibrillose at the disc, appressed squamulose towards the margin; flesh thick, pallid, discoloring vinaceous-brown when injured; odor, of "mushrooms;" taste, mild. 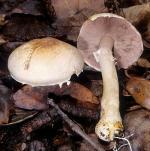 Cap 7-19 cm broad, cylindrical to convex, expanding to nearly plane in age; surface dry, ground color pallid to white, covered with fine, appressed greyish-brown scales, concentrated at the disc; flesh white, thick, slowly becoming vinaceous when injured; odor strongly of phenol; yellowing in KOH. Cap 2-6 cm broad, convex, broadly so to nearly plane in age, sometimes with a low umbo; margin at first incurved, then decurved, finally either plane or slightly raised; ground color cream-buff covered with vinaceous-brown to buff-brown appressed squamules or fibrils concentrated near the disc, diffuse towards the margin; surface bruising yellowish, eventually orange-brown, yellowing in KOH; flesh white to pallid, soft, thin; odor and taste of anise. Cap 6.0-12.0 cm broad, globose to deeply convex, becoming convex to plano-convex at maturity; margin incurved, then decurved, eventually straight; surface dry, white, glabrous to innately fibrillose, in dry weather sometimes squamulose; yellowing slowly when bruised or with age, yellow with KOH; context firm, white, unchanging, up to 1.5 cm thick; odor of anise or almonds; taste mild. Cap 7.0-12.0 cm broad, cylindical-convex, expanding to broadly convex, finally plane; margin decurved, sometimes slightly fringed with veil fragments; surface in youth appressed-fibrillose to finely squamulose, the fibrils pale-yellowish over a whitish ground color, becoming fibrillose-squamulose, the scales hazel-brown, tawny-brown where handled; context white, up to 1.5 cm thick, unchanging; odor and taste almond-like. Cap 0.8-3.0 cm broad, convex, expanding to plano-convex; margin at first slightly incurved, then decurved, nearly plane at maturity; surface smooth, sticky when moist, otherwise dry, pale tawny-brown, fading to buff-brown, almost cream in age; flesh thin, whitish to buff, unchanging; odor and taste farinaceous. Cap 3-6 cm broad, convex, broadly so to nearly plane in age, occasionally with a low umbo at the disc; surface smooth, but commonly cracked in dry weather; color tan-brown to "biscuit brown," the margin lighter, fading overall in age; context white to cream, soft; odor and taste mild to farinaceous. Cap 1.0-4.5 cm in diameter, at first deeply convex, expanding to broadly convex, the disc depressed or raised; margin occasionally wavy, incurved when young, decurved to plane in age; surface appressed-fibrillose, sometimes appearing silky, white to cream-buff, sporadically bruising pale salmon to cream-yellow; context thin, 2-4 mm thick at the disc, white; odor mild; taste somewhat farinaceous.